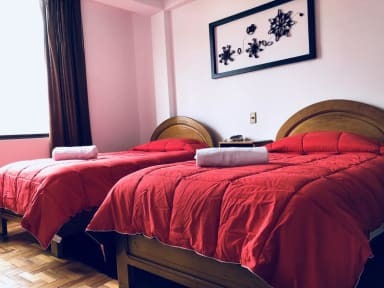 We offer great service in an ideal atmosphere to relax after exploring the wonderful city of La Paz with hot showers 24 hours, free Wifi and welcoming English speaking staff who will be happy to help you with anything you need. We have everything you need to enjoy this beautiful world wonder city and give you all the facilities and amenities that are hard to find in Bolivia, in a safe and good location area. 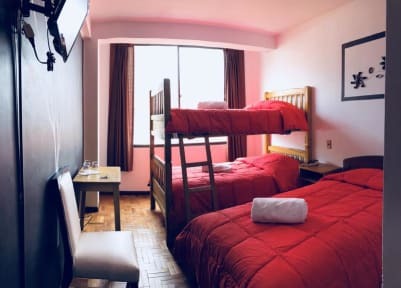 Everything is close from Hostel Porvenir!Hostel Porvenir is strategically located just around the corner of the places of most touristic interest in La Paz. The Basilica of San Francisco church, one of Bolivia’s most beautiful churches & the Witches market with it’s amazing traditional and handicraft market are just around the corner. We are your perfect base to explore the World Wonder City of La Paz, whether you travel solo, as a couple or in a group. We are located in the 4Corners area, surrounded by a great variety of restaurants of all kinds. The Bus terminal is a 5-10 minutes’ walk from the hostel, in the area you’ll find ATMs, Banks, the Mayor’s Office, Immigration, the Telefericos, etc. All Rooms are stylish decorated private rooms with private bathroom, hot water 24/7 and with TV. All have a wonderful view of this very special city. We have an elevator and a great view from our terrace where you can have breakfast or just chill. Great location and the lady at the front desk was very nice and accommodating. Perfect for our one night stay. This place is very conveniently located and it makes a great base to get back to easily when exploring La Paz. It is close to the main Square and most souvenirs shops. The place is clean, well kept and the rooms feel quite private and calm. I was sick while staying there and the staff went out of their way to help me get medicine and food, which allowed me to recover much faster and feel safe. The views from the rooms are nice and the breakfast in the restaurant was better than most places! Staff were friendly and accommodating. This is more like a hotel than a hostel. Breakfast is served in the adjacent Italian restaurant, which was nice. Room was large and comfortable and shower was fine. Location is a close walk to sights. Can't complain and would recommend. A hotel, not a hostel (no common area, offers room service). Very good location near bars, restaurants & cable car station. Large double room with good ensuite. Hot shower, good wifi. A bit cold with no heating & blankets rather than a duvet (both the norm in S. America). Poor curtains & our room, on the corner of the building, was very noisy from very early with lots of traffic going past (and therefore lots of horns bleeping!). They allowed us into the room before official check-in - thankful! Great central location. Comfy beds and clean room. Decent value for money. if I had to revisit la paz for a night or 2 i would return. More of a hotel vibe than hostel. Wi-Fi not very good in the rooms. More of a basic hotel. Rooms are cold and noisy. Breakfast was supposed to be included but we were charged for it. Staff were nice and room was mostly clean. No atmosphere. I don’t recommend this hostel. You can certainly find better places for his amount of money in La Paz. A lot of the facilities weren’t working well (shower, toilet, wifi) and I was very unhappy with how I was treated as their guest.